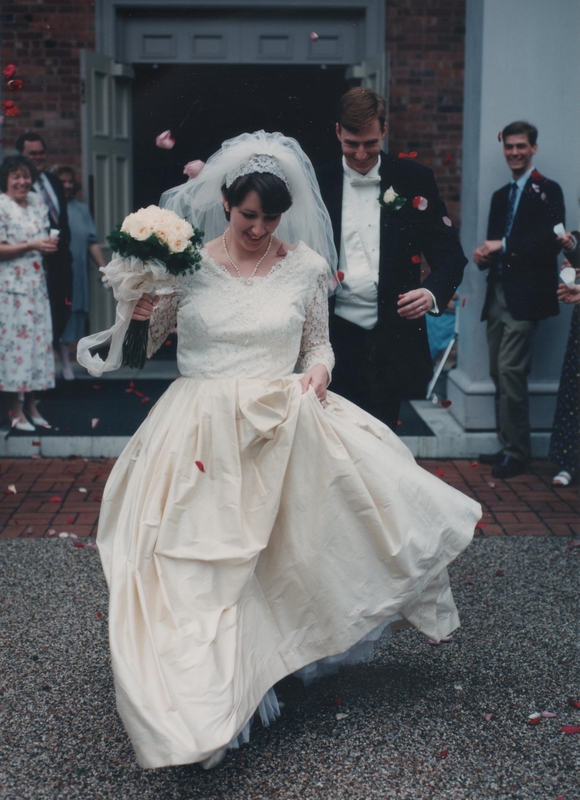 Yesterday marked the 15th anniversary of the day Carla Lynn Barron became my wife. Emily Post would tell me to celebrate the occasion with a gift of crystal and an arrangement of roses. Somehow, that just doesn’t seem to fit. It hasn’t always rained rose petals, but it’s been a great 15-year run. Rather than blindly opting for tradition – a very “Old South” thing to do – I am customizing things a bit, planning a celebration that matches our mood and needs of the moment. Early on in our marriage, we established the tradition of switching off the responsibility for planning our anniversary. We thought it was silly for one spouse to have to come up with a way to recognize our anniversary every year when both of us entered into the relationship and both of us exert energy to keep it going. So we alternate: I plan odd years, Carla handles the evens. That means I got the first year, and then I get all the fives, which will someday include our 25th. Carla got 10 and will have all the 10-year increments after that. It’s a good system that works for us. Another anniversary tradition we started early on was an anniversary journal. Carla gave it to me as a gift on our third anniversary, and it became the way we express our feelings about the previous year. You can tell when times were tough at a glance: the dates of our entries fall weeks even months after our actual anniversary date. But those have been few and far between. The journal has been a much anticipated part of our annual commemoration and saves on buying those cheesy, over-sexed anniversary cards that never really say what you are feeling. As I made the anniversary plan this year, I surmised that Carla needed the all-important words of affirmation found in the journal entry and some time without the kids. I have been traveling for work a lot this spring, leaving her to handle the boys all by herself too many nights. So while we acknowledged the actual day yesterday with roses and a journal entry, we’ll really celebrate tomorrow. SPOILER ALERT! (This is top secret, and Carla doesn’t know! Don’t tell her!) Carla’s day begins with a 90-minute massage appointment. I’ll take the boys to free comic book day at Odin’s, and she’ll have the early afternoon to relax, get dressed and enjoy some quiet time in her own house. At 2:30 p.m., Rachel arrives to watch the boys, while Carla and I head to the Decatur Garden Tour for several hours of child-less strolling around immaculately landscaped homes, conversation and maybe even some hand holding. We’ll follow that up with an early dinner at Parker’s on Ponce in downtown Decatur, not rushing to get home. With the kids in bed, our nightcap will be a movie streamed from Netflix. Her choice, of course. Probably a romantic comedy. No great shakes, right? Just a simple plan of spending time together that won’t break the budget. I don’t feel pressure to jet off to some exotic locale for a weekend getaway just because our anniversary ends in a five. I’m aiming for meaningful interaction, shared experience and a relaxed pace. Enjoyable over splashy. I think that’s really more descriptive of our relationship. We share our lives in ways that enrich each other rather than thrill each other. That’s not to say I still don’t have a rush of excitement to see her after a business trip, or the occasional date night doesn’t help me remember why we fell in love in the first place. Overall, though, our relationship is more stable than sparky. Still, I don’t view being married 15 years as an accomplishment. Yes, it’s not always easy being married. It takes effort and, to invoke the cliché, you do have to make the daily choice to love your spouse. But my life is so much better with Carla that I don’t even want to imagine what the last 15 years would have been like had I not had the good sense to marry her on that stormy May afternoon. We’ve had some tough times, but really, with the benefit of time and perspective, I can honestly say that our marriage is great. We’ve grown closer and stronger through every challenge. I’m sure there will be days in the future that test us, but at the 15-year point, our marriage is hitting its stride. Thank you, Carla, for sharing life with me. I don’t mind folks knowing that I need you. So until next year’s entry in the journal, happy anniversary. I love you. If you survived the total mushiness of this entry and would like to share your anniversary traditions, leave a comment below. Or if you have a tip that has enhanced your marriage, share it so we can all benefit. Lance Elliott Wallace lives and writes in the Atlanta suburb of Lilburn. A native of Texas and a former resident of Florida and Alabama, Lance married a Georgia girl and together they are rearing three Georgia boys. By day he communicates for Georgia Tech engineers and scientists. He spends his early morning hours praying, writing and running. This entry was posted in Uncategorized and tagged anniversary, anniversary gifts, anniversary ideas, babysitter, contemporary South, Decatur Garden Tour, Emily Post, gifts, Lance Elliott Wallace, Lance Wallace, marriage, massage, Netflix, New South, New South Essays, NewSouth, Odin's Comics, Parker's on Ponce, relationships, South, Southern, Southern Culture, Southern Living, Southerners, the South, traditions, wedding. Bookmark the permalink. WOW! Way to go you two! Enjoy! Happy Anniversary, Lance and Carla! Keep on celebrating your love for each other. Happy anniversary! Our family is so blessed to know you as friends. Love you both! What a super plan, Lance. Hope it was all you hoped.